Boat propellers are getting jammed in nearby lakes by dense growths of the invasive species starry stonewort. Lake Koronis (120 miles S of Long Lake). Dredging has started in Big Turtle Lake to try and remove the dense underwater growths. It is estimated to cost $800,000 to treat Lake Koronis. 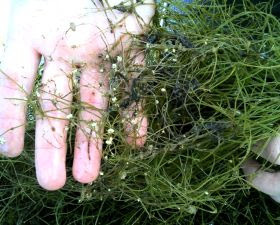 Starry stonewort is spread by physical transfer of the tendrils, so it is now even more important to thoroughly clean all boats entering Long Lake, even if they have only come from nearby lakes.